Thanksgiving Tablescapes are on our mind as the leaves begin to fall and family plans are coming together. 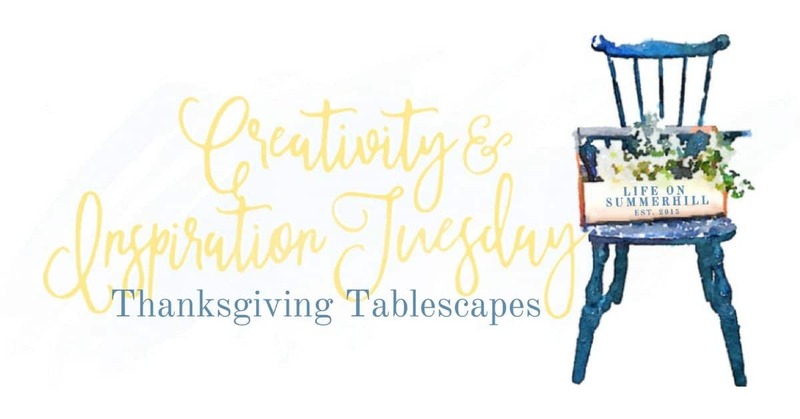 We hope this Creativity & Inspiration Tuesday will make this holiday a little more relaxing. 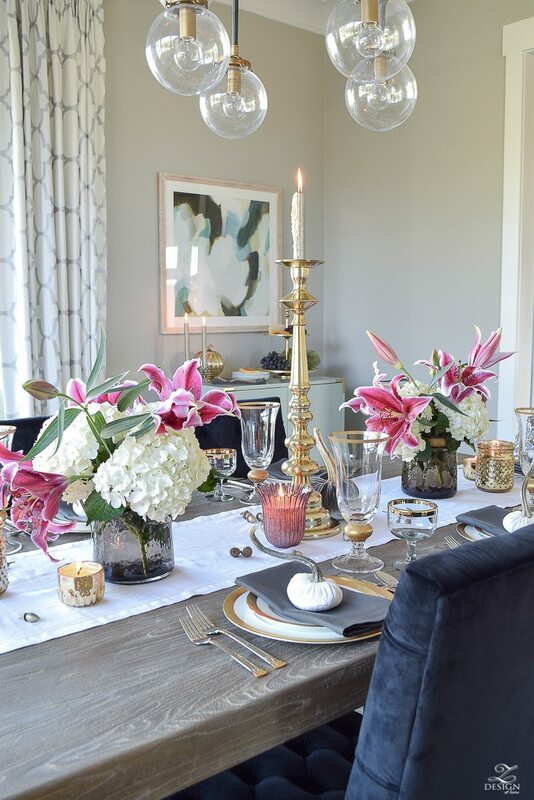 Grab some design ingenuity from our friends out there who are gifted beyond imagination when it comes to making dinner guest feel as though they have been whisked away in a dream when they see the beauty of the tablescape. Thanksgiving Tablescapes can be one of the last things some of us think of. But, we hope this post inspires you to make it one of the first things you think of. This way, if the turkey burns, the pie gets dropped on the way to the table or someone forgets they were supposed to bring the stuffing, the focus isn’t on the food! We never leave the table on Thanksgiving Day. Are we the only ones? If not, why wouldn’t you want your tablescape to be breathtaking? 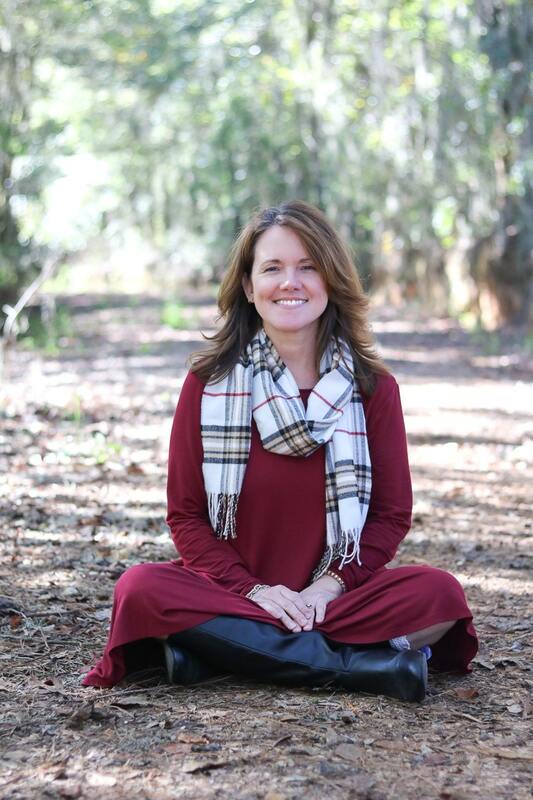 Come and be inspired! We’re suckers for everything black and white. It’s just classic. So the beauty and elegance of this tablescape is so comforting and it brings so many things to our mind that we’re thankful for. 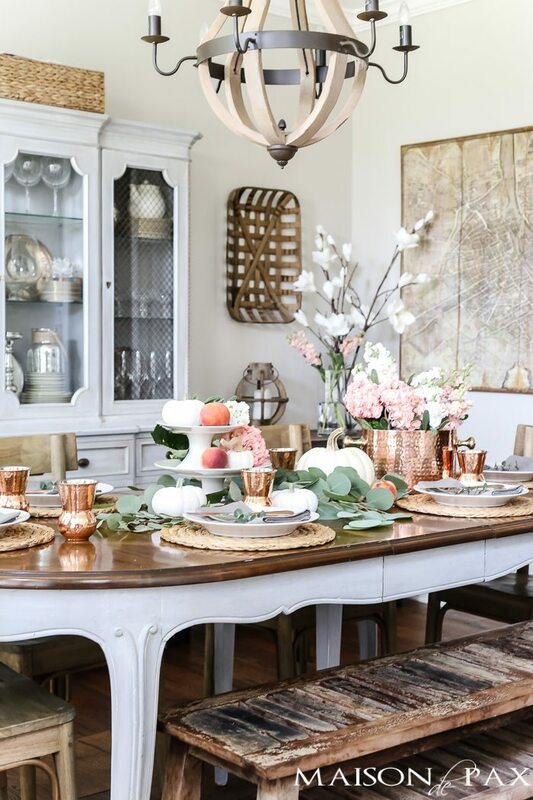 Does this table not encompass everything we all love about farmhouse decorating? 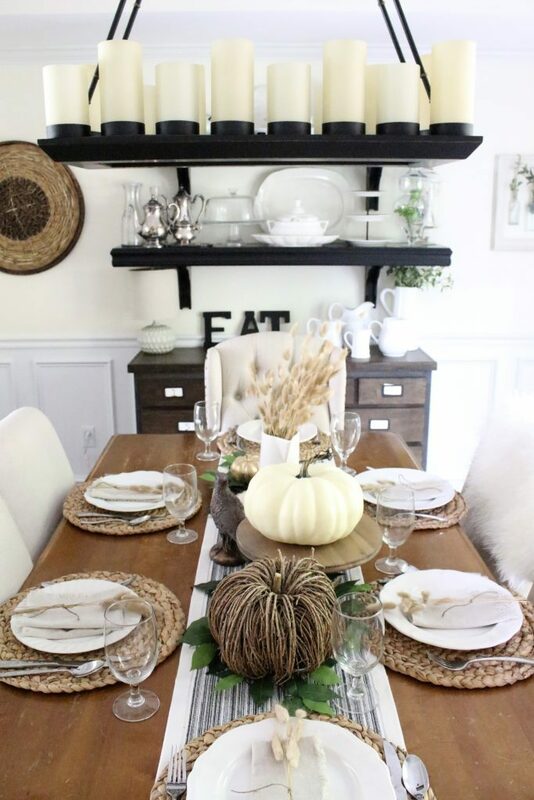 The table, the bench, the white pumpkins and the copper accents are all stunning yet simple. Eucalyptus leaves, peaches and hydrangeas provide a sweet pastel touch to this out of the box fall setting. Amy used so many unique textures in her tablescape. 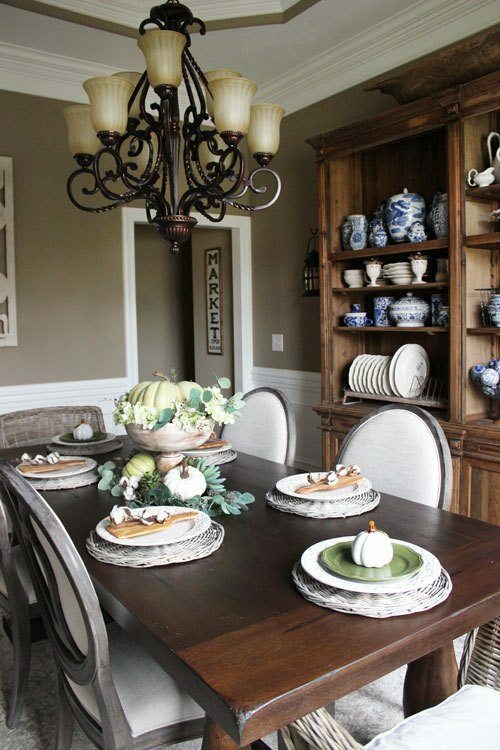 The neutral white and green pumpkins she incorporated on her table are simply serene. Don’t you adore the woven chargers with the wheat stalks tied into the napkin? This way you can add in whatever splash of colors you want. Talk about something to be thankful for! Y’all! We don’t even know where, to begin with, these place settings. The cotton stem on a breadboard! It’s so simple, yet we wouldn’t want you to move it in order for food to be placed on our plate! Our cotton post should give you a hint on our love for using cotton in everyday décor. Maybe you’re looking for a Thanksgiving tablescape for you and your sweetheart. This setting Abigail put together, is so romantic! 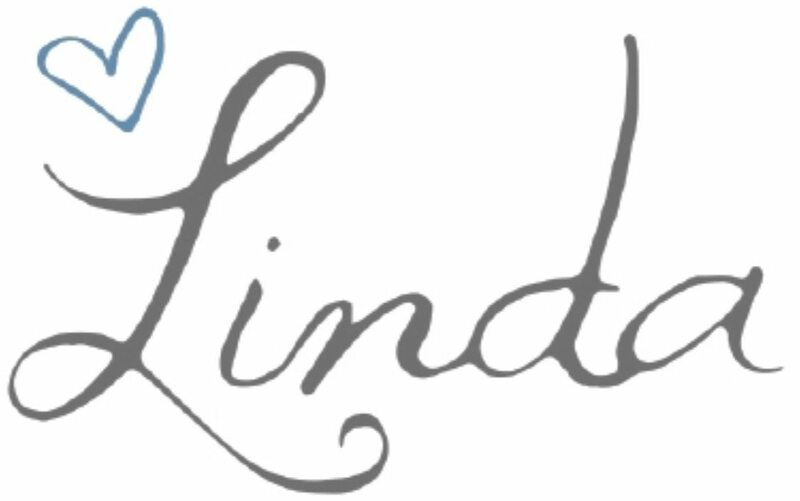 She uses Cinderella pumpkins, votives and candlesticks to bring so much elegance to this table. Your special someone will be extra thankful for you this Thanksgiving. 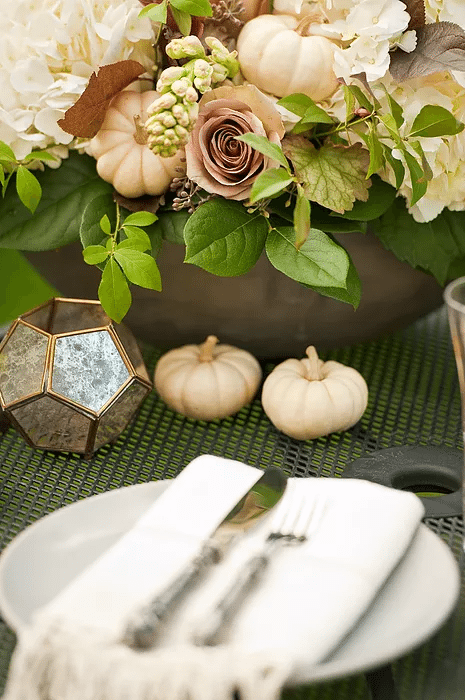 If you hadn’t seen the photo above and I told you I knew someone who made metal coffee cans, dollar store pizza pans and white wool into an elegant outdoor Thanksgiving tablescape, you would think I was crazy! But, Emily did just that. She gives amazing tips on how you can duplicate this look for your celebration. Thank goodness for talented friends that are willing to tell their budget-friendly secrets. We love how Bree chose a white linen table runner and charcoal linen napkins. Then added simple smoked glass vases with an elegant gold band to hold one of our favorite flowers, the stargazer lily. Gold acorns and velvet pumpkins in shades of white and gray make alluring additions to our last by not least tablescape. 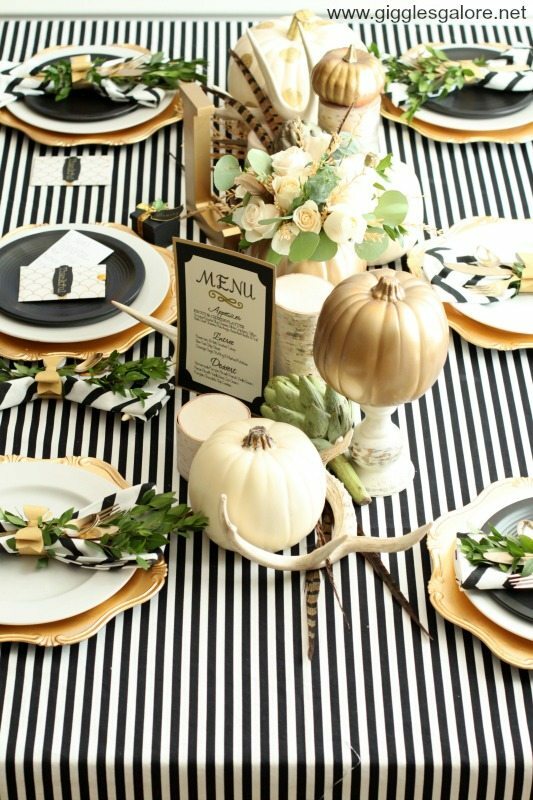 We hope this post inspires you to make your Thanksgiving Tablescape amazing! We also hope that this collection of ideas take a little off your plate (excuse the pun). Bree, Thanks again for allowing us to share your table with our followers. Happy Decorating! What a lovely collection of ideas. 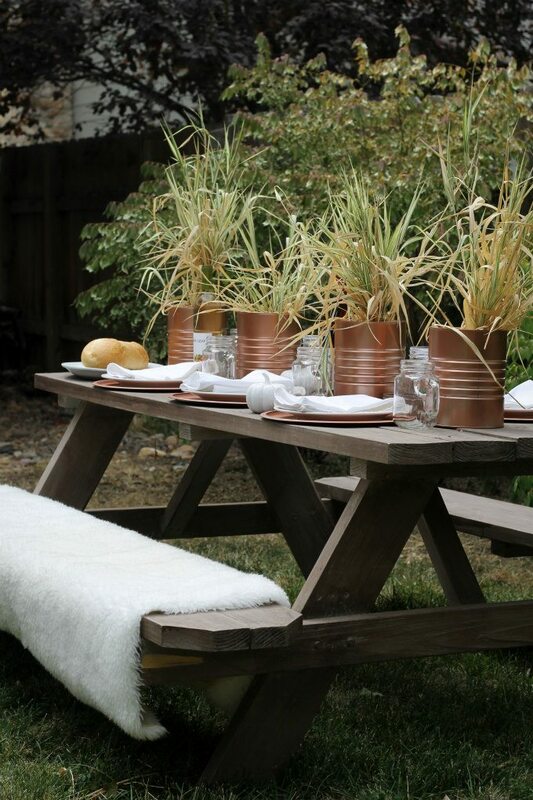 Thank you for including my outdoor tablescape. Thank you so much for allowing us to share your beautiful table!